In this digital era, technology has become an integral part of our everyday lives. From smartphones, and high-tech smart homes to sensor-equipped music speakers, technology is almost in every corner of our houses. 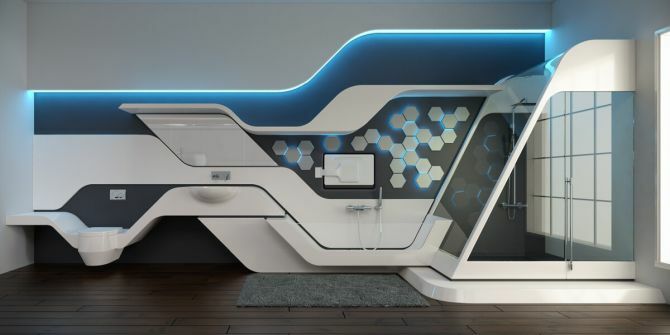 Keeping up the pace with the modern tech-savvy world, UK-based company QS Supplies often comes up with futuristic bathroom and kitchen designs for modern-day consumers. Marking 25 years of togetherness, Car design firm Pininfarina and kitchen cabinets manufacturers Snaidero launched a limited edition Ola25 kitchen featuring unique design and functional characteristics at the Milan Furniture Fair which concluded few weeks back. Paying tribute to Pininfarina’s 84 years of activity, only 84 individually crafted units will be produced. Basically taking inspiration from the iconic design of Ola20, the new refined Snaidero Ola25 kitchen is a perfect combination of Pininfarina heritage automotive design and Snaidero’s kitchens manufacturing experience. Tailor-made to the client’s desire, the Ola25 comes in three different versions, thus providing the customers with design options.